Understanding the Boll Weevil's Impact Looking Forward - JP loves LIFE! The boll weevil is one of those pests that achieved legendary status for the path of destruction it left in its wake. And to my mind’s eye, its one of the few pests to achieve such notoriety specifically for the impact on crop production and the impending doom it caused society. I would guess it ranks fairly close to the potato blight imposed Irish potato famine in terms of notoriety. But its amazing how little people actually know about the bug! 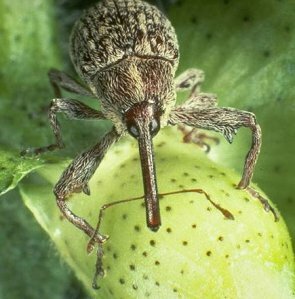 The boll weevil is not native to the United States even though it seems to be one of the most frequent things people think of in connection to US cotton. The economic havoc caused by this pest was what spurred diversification of crop production across the heart of the US Cotton Belt. The Boll Weevil Monument in Enterprise, Alabama is the world’s only monument dedicated to an insect pest. Thanks to the coordinated grassroots efforts of cotton farmers and the industry, we have virtually eradicated this pest, sending them back to their native Central American homes! In fact, we’ve been so successful we get actually counts of weevils caught in different geographies. And for years one of the questions I got most frequently about cotton came from people driving through the Mississippi Delta wondering what the green things were, some suggested they were hummingbird feeders but they were weevil traps to see if there were changes in the boll weevil populations. The hard freeze that extended well into Mexico in early February, along with an aggressive approach by the Texas Boll Weevil Eradication Foundation, Inc., and cotton farmers’ strong commitment to stalk destruction last fall put Texas a big step closer to eliminating the boll weevil as an economic pest across the state. via Hard freeze, aggressive program reduce boll weevil numbers | Cotton content from Southwest Farm Press. My guess is we won’t have much reason to sing the Boll Weevil blues other than we like Brooks Benton, Eddie Cochran or the White Stripes. Here are two very different versions of the tune, which do you like best?